Unlike the movie industry, which churns out one blockbuster hit after another all summer long, the video game biz saves its big guns for the holiday shopping season later in the year. But that doesn’t mean your summer has to be game-free, and these are the new releases we’ve been playing instead of wasting our time enjoying the warm, sunny weather. Dan: I’m a sucker for literary allusions in games, such as the Ayn Rand influences in BioShock or frequent nods to Asimov in the Mass Effect series. This military shooter works as a modern retelling of Joseph Conrad’s Heart of Darkness (the 1902 novel that was the basis for Apocalypse Now), going so far as to name the seemingly rogue officer you’re searching for Colonel Konrad. Beyond that, the game’s pacing is excellent, with frenetic shootouts, hostage rescues, and tension-filled sneak attacks. 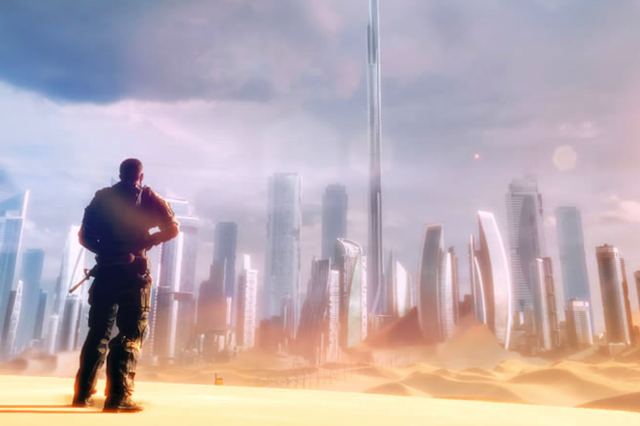 The setting, a near-future Dubai half-buried by epic sandstorms, gives it an original look, and it’s a nice change of pace from the usual warehouses, dungeons and spaceships. Libe: A perfect mash-up of childhood memories, the LEGO-plus-X formula has worked for LEGO Star Wars, LEGO Harry Potter and LEGO Batman, among others. The caped crusader and his tights-wearing pals (a big chunk of the DC Comics roster turns up) are back in a sequel that feels, perhaps counterintuitively, a bit more more grown-up. That means you have a big chunk of Gotham City to wander around and explore freely, although the major story missions still take place in set locations. And, unlike earlier games, which featured mute characters miming and mugging for the camera, LEGO Batman 2 has a full script and voice actors (many from the various animated Batman cartoon shows), More importantly, it has an irreverent sense of humor about its self-serious crime fighters, highlighted by Batman and Superman engaging in an ongoing swagger-off about who’s the most super of the heroes. Dan: Nerd confession time: I’m a huge Doctor Who fan. But this nearly 50-year-old series has inspired only a handful of lame video game spinoffs, despite winning massive new audiences (especially here in the US) with its modern-day revival. The Eternity Clock, available as a downloadable PlayStation 3 game, isn’t quite the epic time travelling adventure we’ve been waiting decades for, but it does manage to capture the quick-witted humor of the source material with a wordy, jokey script performed brilliantly by TV series actors Matt Smith (the 11th Doctor) and Alex Kingston (sidekick River Song). The game itself is mostly running, jumping, and puzzle solving, but the style is a 2D throwback — you can move forwards and backwards only, much like old-school games such as Super Mario Brothers. The Eternity Clock is trapped by the conventions of its side-scrolling mechanics, but worth a playthrough from fans for the as-good-as-TV writing and voice acting. Also of note: If you liked The Walking Dead video game as much as we did, the second of five short-form episodes is available now to download for the Xbox 360, PC/Mac, and PS3.